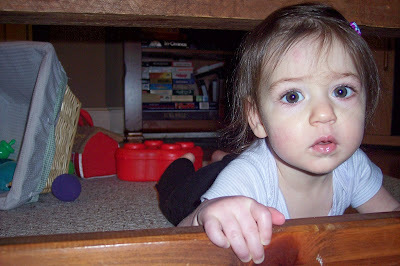 Cate enjoys being under our coffee table, although she sometimes thinks she's stuck. She's not ... just part of the way over the piece of wood you see her contemplating in this picture. This all, of course, when she's not pulling up on it. she looks like she's feeling much better! She is changing so much lately or maybe it's just the angles of the pics or someting - so cute!